When I stumbled upon the display of the Gigi Hadid x Maybelline collection over the Christmas holiday, I couldn’t help but swatch a few of the items. The first thing from the collection that attracted my attention were the lipsticks. The colour selection was amazing and the testers swatched really nicely, but unfortunately the colour that really attracted me (Erin from the East Coast Collection) was sold out. Moving towards the other side of the display, I was greeted by squeals of excitement from a group of girls. They were swatching the highlighters and I was immediately intrigued. 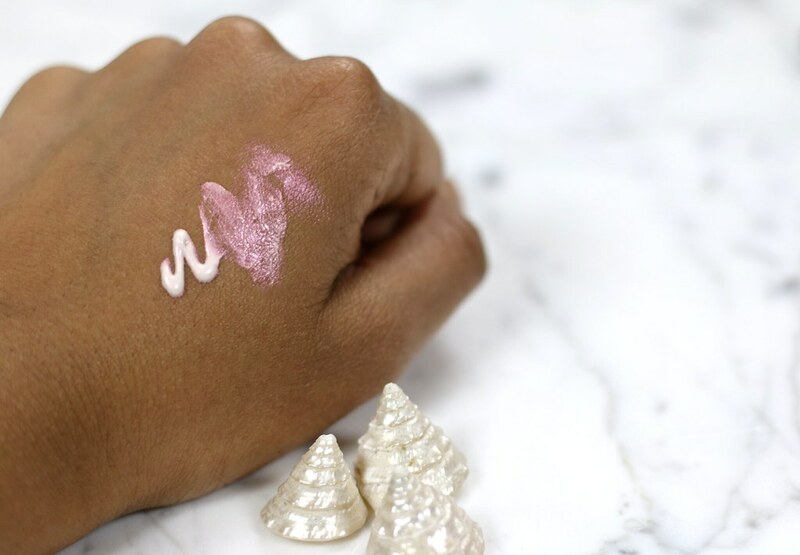 If you have read my Fenty Beauty Killawat Highlighter review, you know that I’m on a mission to find the perfect ‘glitter free’ pink highlighter. Although I like and use the Fenty Beauty highlighter for more glam looks, I was still on the hunt for something more pink and with less visible glitter particles for day time looks. Once I swatched the Strobing Liquid in Iridescent I knew I had found the highlighter I had been looking for! The liquid comes out as a white lotion, but you can straight away see it’s reflective quality around the edges in the photo above. 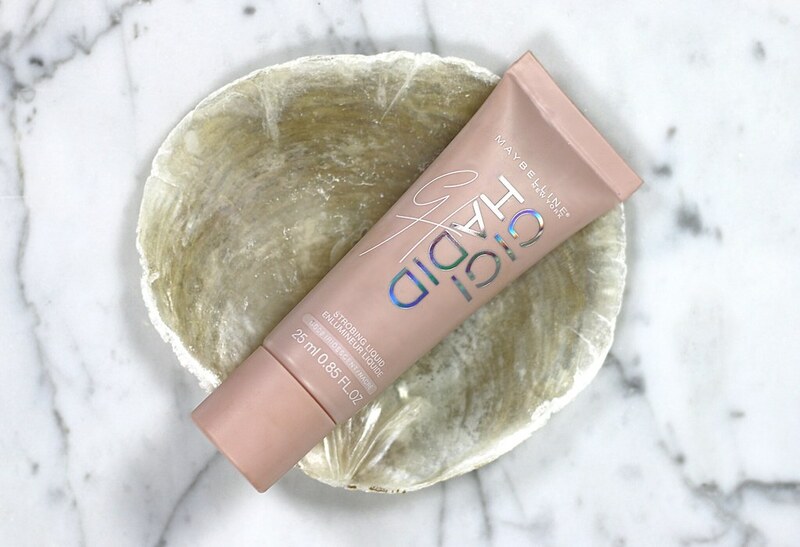 As soon as you touch it, it transforms in a gorgeous sheer pinky glow that is made to stay on your face throughout the day. I like to apply this product by squeezing a bit on the back of my hand and transferring it to my face by bouncing a little bit of it to the high points of my face from a damp beauty sponge. Even though it is a lotion, it doesn’t disturb any (powder) layers underneath it. 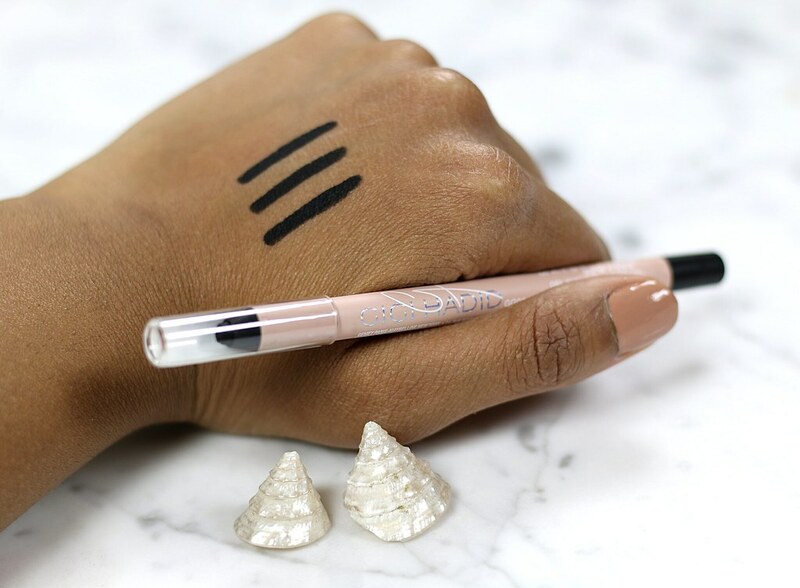 The colour is noticeable after one layer and pairs beautifully with blush, but can also be easily built up by adding additional layers if you want to want the highlighter to pack a bigger punch. My favourite gel eyeliner is the Maybelline Lasting Drama Gel Eyeliner, so it came as no surprise to me that I was equally by the intense matte black finish of this gel pencil eyeliner. After application you have some time to manipulate the product in your desired way, but after it has dried down it is completely budge proof! I usually prefer a very clean (non smudgy) wing eyeliner look, but with this eyeliner I have been able to create a more effortless, smoky wing eyeliner look that didn’t fade at all. All in all, I was pretty impressed with the products that I swatched and bought. Unfortunately, the Gigi Hadid X Maybelline collection was limited edition and is pretty much sold out everywhere. However, if you would like to try out the highlighter and you didn’t scoop it up soon enough, I later learned that the regular Master Strobing Liquid in Light Iridescent from Maybelline is pretty similar, if not completely identical!